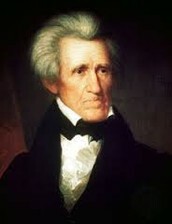 One of the many reasons I consider Andrrew Jackson a zero as a president is the Indian Removal Act. He forced thousands of Indians to leave their native lands and walk over 2,000 miles to much smaller, less valuable reserves. Why did he do this, you ask? Did he do this out of care, or respect? No! It was all for a little bit of gold. Another almost criminal thing he did was close one of the few things keeping our economy stable: the National Bank. Yes, that's right, he closed the National Bank and deposited government funds into various state banks, all because he thought it was only helping the "elite." It's the dividing of people into elite and common classes that made him a bad president. 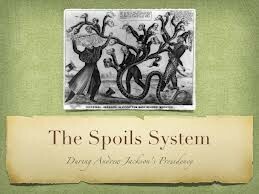 Last, but certainly not least, is his use of the Spoils System that makes him a zero in my eyes. Anyone who supported him immediately received a position of power in the government. This process essentially corrupted our government, and ruined his reputation as a good president. A map of the path the Native Americans took to go to their new land. This particular cartoon shows how poorly Jackson and the people of his time treated the Native Americans. 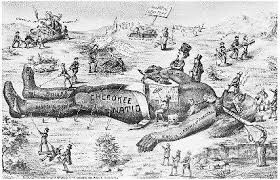 It depicts a giant Cherokee who represents the Cherokee Nation being tied down, just like the real Cherokees were theoretically tied down by the Americans.